First time reader (listener) of Robin Cook, excellent book!!! I've been in medical profession of some sort since early 1980's, so I enjoyed the storyline! Some parts actually had me clinching my teeth, and I even yelled out "run faster" during the climax part of the book! & the narration is great, he's very good at keeping characters different! I've started next Robin Cook book & same narrator, so right away you continue your relationship with flow-over characters from last book! Thank you for that!!! Entertaining even though it fizzled at the end and was extremely predictable. 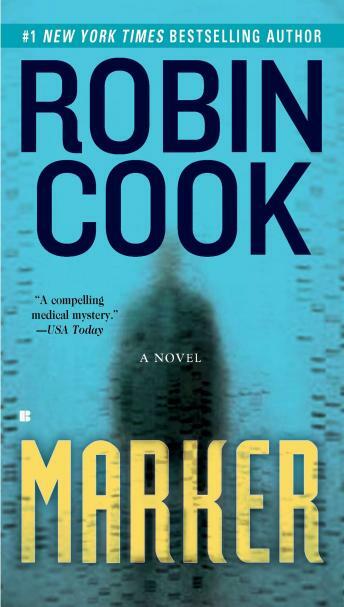 Marker kept me on the edge of my seat, a classic Robin Cook medical thriller. I thought there were some parallels to another Robin Cook book, Coma. I would definitely recommend Marker to any fan of medical thrillers - amazing! If you enjoy Robin Cook I believe you will enjoy this book. It was a little tedious listening to discs covering the middle of the book but then it picked up and I looked forward to hearing what was going to happen next. This was fine: an interesting story and read well enough. The narrator does a decent job with the different cultures and voices, although not outstanding. This was my first Robin Cook audiobook, and I don't think I will do another soon. There is too much background - I much prefer character interaction. Perhaps an abridgement would have been better. This, to me, is an easier book to read than to listen to. But that is my personal preference. On the whole, it was acceptable, and I'd recommend it to audiobook fans of the author. This was an excellent story, and I really enjoyed the reading. It was an excellent (but frightening) premise. This book was excellent! I've read some of Robin Cook's other books, but I think this was the best. The narrator was also excellent. I loved this book. I was only luke-warm to Cook's earlier novels, but his latest two, this one and Seizure, were great. Good character development, smart dialog, and political over-tones that lend reality to the fictional medical thrillers. The reader is one of the best in my opinion as well. Highly recommend. I'm a retired criminologist and look at Dr. Robin Cook' s works scientifically. The third half of Marker gets very exciting. I looked up his medical terms either in my medical dictionary or on the web, and this time he didn't use his imagination too much. I've listened to twelve of his works, and this one is good too.